Keep in mind that by default modern authentication is disabled on Exchange Online. To enable this please following this guidance. Two weeks ago I started with this series of blog posts about conditional access for PCs and I started with the requirements for conditional access for PCs. Last week I built onto those requirements by adding the SharePoint Online Policy, and the Compliance Policy, and I finished with showing the end-user experience. This week, in the third part of this blog series, I’ll also build onto those requirements by adding the Exchange Online Policy and again the Compliance Policy. After those configurations are in place, I’ll also finish, this third part of this blog series, with the end-user experience. Note: This post shows a few identical configurations as I also mentioned in the second part of this blog series. This allows one to configure the Exchange Online Policy without going through the configuration of the SharePoint Online Policy. 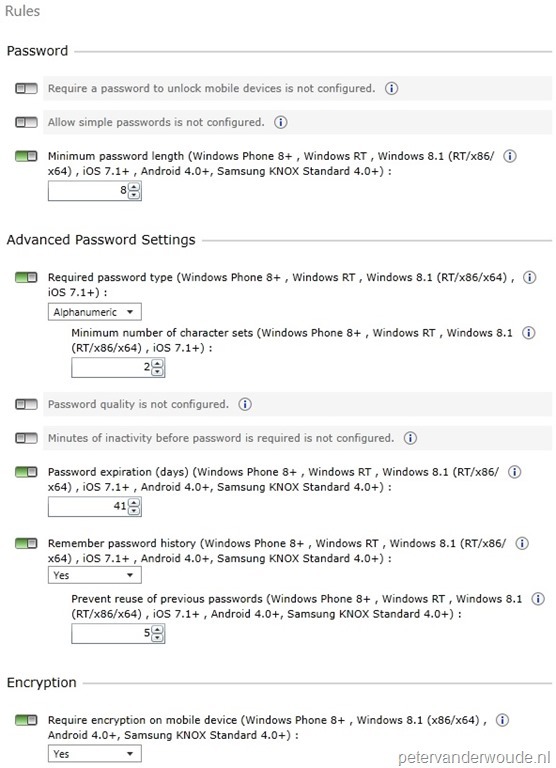 The configuration of conditional access for PCs contains two actions. The first action is to configure the Exchange Online Policy and the second action is to configure the Compliance Policy. Now let’s start with the first action, which is the configuration of the Exchange Online Policy. This policy is used to manage access to Exchange mail, based on the configured conditions. The configuration of the Exchange Online Policy is the same for both Microsoft Intune standalone and Microsoft Intune hybrid. The road to the setting might differ, but, in the end, the configuration has to be performed from the Microsoft Intune administration console. 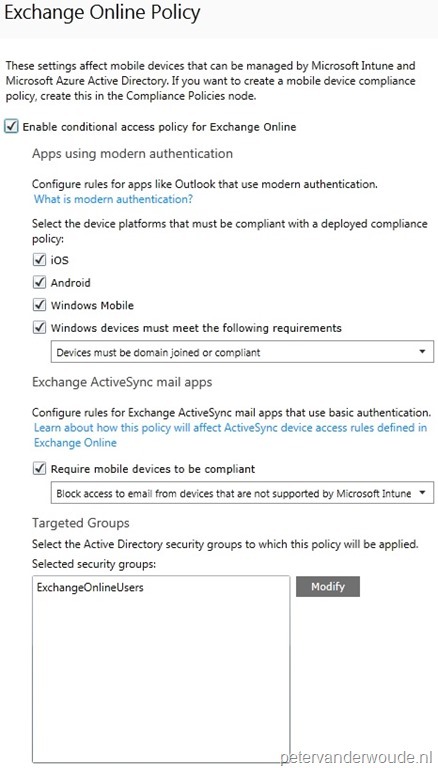 To enable the Exchange Online Policy for PCs select at least Enable conditional access policy for SharePoint Online and Windows devices must meet the following requirements and choose, based on the requirements, between Devices must be compliant, Devices must be domain joined or Devices must be domain joined or compliant. 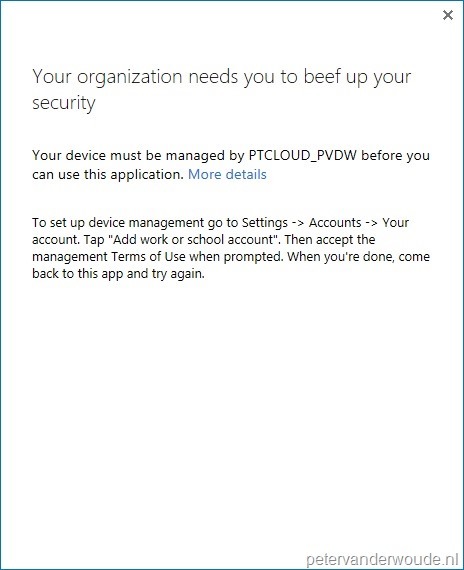 To prevent mail apps with basic authentication from connecting select Require mobile devices to be compliant and choose Block access to email from devices that are not supported by Microsoft Intune. However, this configuration should not be required, as one of the requirements is to also block non-modern authentication protocols in AD FS. To make sure that the Exchange Online Policy is targeted to users, configure a security group as a Targeted Group and, when there are users that need to be exempted, make sure to configure a security group as an Exempted Group. After saving the policy, it takes effect immediately. Note: For testing the end-user experience I’ve tested the Exchange Online Policy with all three possible configurations for Windows devices. After the complete configuration is done, it’s time to look at the end-user experience for the Outlook desktop application. In this case I’m talking about the end-user experience of a blocked user, as the end-user experience of an allowed user doesn’t differ from any other Outlook experience. When the end-users’ device is not compliant, or not joined to the domain, the end-user can get the messages as shown below when Outlook is trying to connect to Exchange Online. The not compliant message will also show when the combined option is configured. The examples are shown for Outlook 2013, but the Outlook 2016 experience is identical. Note: It might take a moment before an existing Outlook connection will be blocked when the device is not longer compliant. Is there a way that you are aware of that enforces the Conditional Access via the Browser but allows OWA access from non Company managed devices. If the Origanization wants to block access to all services from non Company Devices BUT wants to allow their staff to still access their email (OWA in Office365) from their home computer is that possible as a exemption? Sounds like a very bad backdoor, which bypasses the use of conditional access. That being said, I think you should be able to create a claim in ADFS to do something like that. Peter, I’m struggling with the docs on this one. 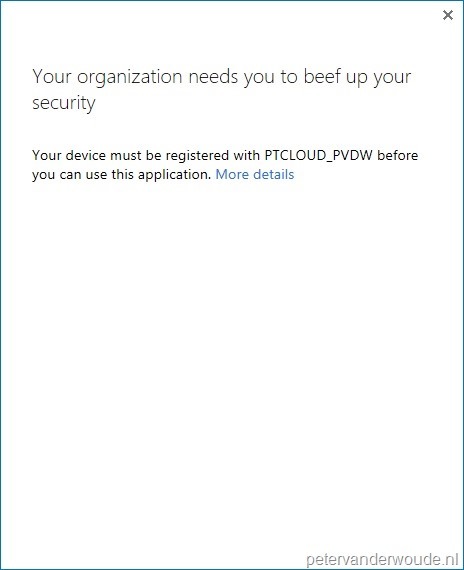 The Windows PC setting: “Devices must be domain joined or compliant” is confusing. In an Intune Hybrid environment, where a Win10 PC is non-domain, would it be “compliant” if it was managed by SCCM and not “non-compliant” ? Or is Intune the only option?? 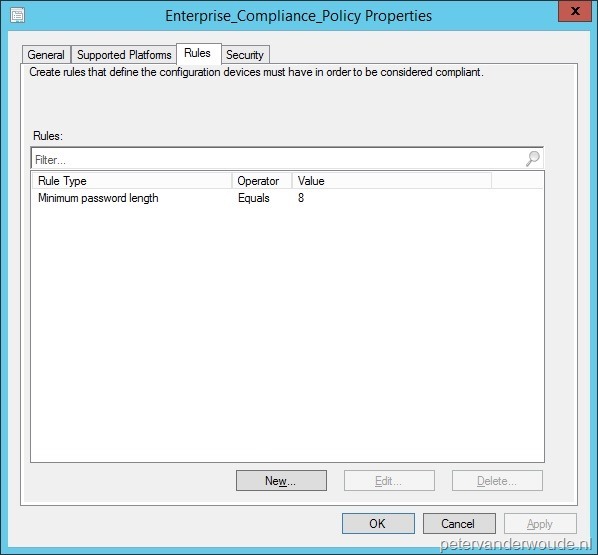 Devices managed by SCCM can also be targeted with compliancy policies via SCCM. When a device is compliant to that policy, or no policy is targeted, its marked as compliant.